We’re now doing videos! And to kick it off we are featuring one of our new favourite restaurants GaiJin Izakaya (which just opened in December 2018), where chef Ed Lam and his crew are making some of the best robatayaki and ramen you’ll find outside of Japan. Regular readers already know our obsession with Lam’s inventive ramens at Yujiro (where he is also the co-owner and chef), while at Gaijin (2-1575 Regent Ave West) he’s created a menu that serves ramen all day/night while showcasing to Winnipeggers why izakayas are so popular in Japan (along with other Canadian cities with larger Japanese populations like Vancouver and Toronto). 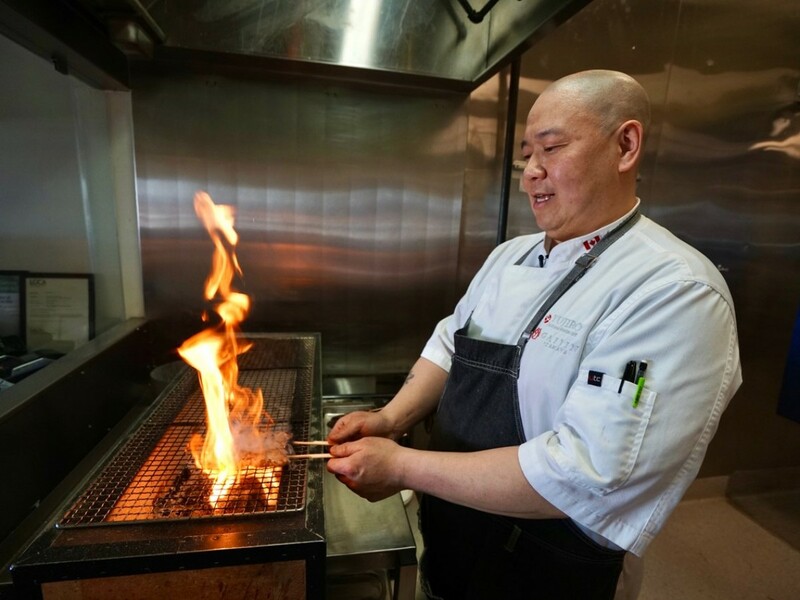 Above, chef Lam shows us what goes into making various robatayaki dishes – which are cooked over both Japanese and Canadian wood charcoal (the chicken gizzard yakitori is off the charts, while the pork belly will make you forget about bacon – seriously), along with his luscious tonkotsu ramen. He also delves into GaiJin’s tongue-in-cheek name (Lam is from Hong Kong), along with some other tasty tidbits. Please enjoy, then make your way to GaiJin or Yujiro today. Note: our new video series, which we plan to do bi-monthly, will highlight restaurants and dishes that you can find in our Tourism Winnipeg Best Eats 2019 Culinary Guide.